The AIA Guide to Chicago is the premier guide to Chicago's endless architectural treasures. With the guidebook in hand, residents and visitors alike are led through the works of Sullivan, Burnham, Wright, van der Rohe, Weese, Netsch and countless others who have shaped Chicago into a world capital of architecture. From the invention of the skyscraper to the Bungalow Belt, Chicago's cityscape is a living history of architectural innovation and influence. 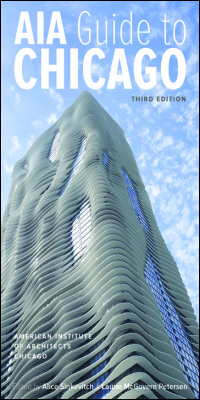 The third edition of the AIA Guide to Chicago brings readers up to date on ten years (2nd edition, published 2004) of dynamic changes, including projects such as Studio Gang's Aqua, SOM's Trump Tower, and numerous others. Four hundred photos and thirty-four specially commissioned maps make it easy to find each of the one-thousand-plus featured buildings, while a comprehensive index organizes buildings by name and architect. This edition also features an introduction providing an indispensable overview of Chicago's architectural history. Click here or on the cover to purchase a copy. "But in describing the many kinds of buildings-office buildings, apartment buildings, private homes, schools, churches, parks, and random curiosities-and pointing out details not only about architectural features but also who built them and why and how they've been used over the years, the authors also obliquely tell the stories of different neighborhoods. AIA Guide To Chicago, 3rd Edition from AIA Chicago on Vimeo.